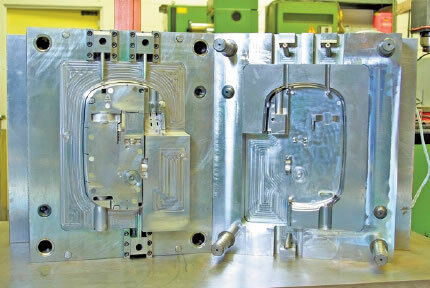 Harvey Precision makes mold tools at its factory in Ashreigney, Devon, UK and has been using WorkNC since 1999. The company produces tools for a wide range of industry sectors including consumer goods, medical, telecommunications and automotive, including molds for parts used by Jaguar Land Rover, BMW and turnkey motorsport projects for companies such as AeroCatch. Counted as one of Sescoi’s most loyal customers, Harvey Precision has seen some major advances in WorkNC since the original installation. John Harvey says, “Over the years we have seen some impressive leaps in functionality, but at the heart of WorkNC is its ease of use, its reliability and the quality of its toolpaths, which is what attracted us in the first place. However, the most amazing advance of all has been the speed increase we got with WorkNC V21. I can only say that when I saw the speed of WorkNC on the new hardware my jaw hit the desk." The high speed Hurco machine used by Harvey Precision cuts the electrodes quickly, rarely taking more than an hour even for the most complex ones. The blank electrodes are first mounted on System 3R pallets and then loaded onto System 3R pneumatic chucks on the machine table making location of the copper blanks quick and accurate.“Once we have created the CNC code for each new electrode in WorkNC we just press start on the machine and it works, the only labor involved is loading and unloading. We have recently added a robot to do the electrode handling, enabling us to run the CNC machine unmanned overnight, producing up to 16 electrodes in series without stopping! If we did not have WorkNC’s 100% reliability, this would be impossible,” says John Harvey.